Holidays with the entire family, as a couple or with friends – South Tyrol’s chalets are the perfect place for unforgettable holidays, which you can organise as you wish. The special holiday homes offer any equipment, making your holidays with your loved ones as enjoyable as possible. In addition to spacious living rooms and bedrooms, the chalets often offer more than one spacious bathrooms as well as a well-equipped kitchen. 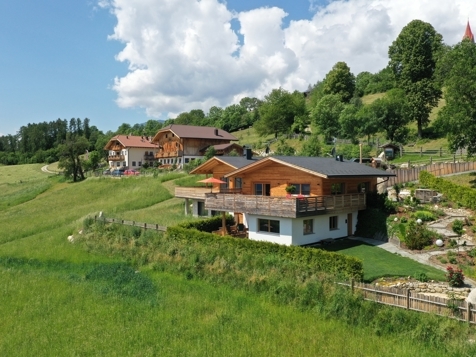 Holidays in a chalet in South Tyrol mean absolute quiet and relaxation, as the dreamlike holiday homes are to be found in the middle of nature most of the times. A dreamlike garden with plays for your children, panoramic terraces and sometimes even a pool turn the pretty chalet into a paradise for families. As well, couples and groups of friends will love these comfortable accommodations. In addition to much space, you enjoy an individually organised holiday, without fixed meal times or other obligations. Moreover, the chalets are a good starting point for outdoor activities of any kind – South Tyrol’s variety offers something for any taste.